High Court judge, Justice Musakwa has today handed down a shocking four year sentence to Zanu PF murderers in a case that has left Mudzi residents and the Magura family dumbfounded. Zanu PF’s Chimukoko ward 3 chairperson, David Chimukoko and his secretary Graciano Kazingizi were sentenced to four years, of which one year was suspended on condition of good behaviour, in jail for the murder of 67 year old Cephas Magura, the MDC Ward 1 Chairperson, in 2012. 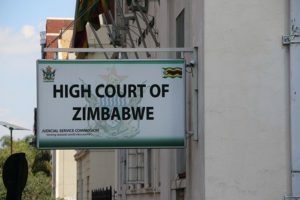 In passing the sentence, Justice Musakwa said the case cannot be classified as murder or culpable homicide but qualifies as a case of public violence; therefore the accused will serve just three years. The same High Court, slapped Last Maengahama and Tungamirai Madzokere with a 20-year sentence on trumped up charges of fatally stoning Petros Mutedza at Glen View 3 shopping Centre during an MDC rally in May 2011. The only difference is one is Zanu PF and the other is MDC! Sekuru Cephas Magura, died from injuries sustained during an assault by David Chimukoko and Graciano Kazingizi at Chimukoko Business Centre. The MDC had organised a rally there with permission from the police. Glaring case of a compromised judiciary. Deep in the pockets of a satanic political party. Blood on their hands, shame. “Democracy” and “Freedom” are more than words to be bantered about. They are descriptions of conditions. In Zim, they are meaningless words… and will never be more as long as ZANU-PF wields power. When a judiciary is so obviously and deeply politicized as this, when being a member of the ruling party is a license to murder, almost with impunity, that subversion of justice by a sitting judge is a crime of the highest order against the nation and its people. 3 – 4 years for murder, seriously? The courts yesterday sentenced Psychology & Pambuka to 6 years for the alleged theft of $12 000 Bondee notes. Somethings wrong here people.